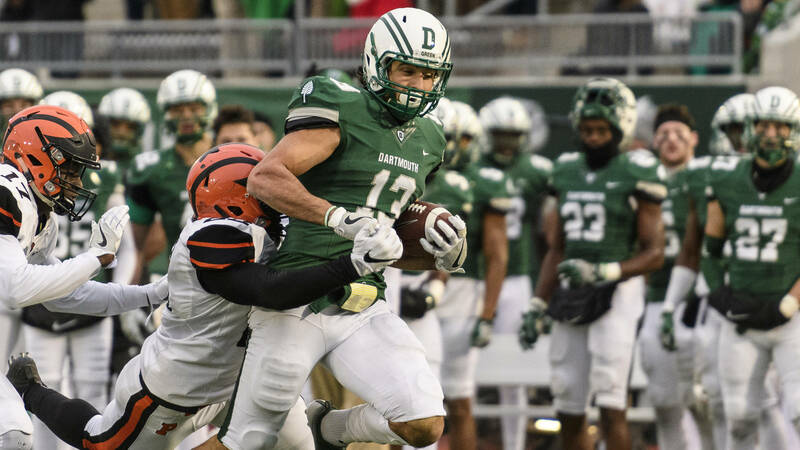 When 7-0 Dartmouth faces off against 7-0 Princeton in New Jersey this weekend, it will be the latest day that two undefeated Ivy League teams have faced off since 2001. It’s unquestionably a huge game, filled with Lambert Cup implications (a trophy which is awarded to the best FCS teams in the East) and Ivy League title implications, with the winner all but assured to be, at least, Ivy League co-Champions. With the possible exception of Air Force at Army, it’s the best college football game being played in the Northeast this weekend. And yet, with all the fanfare of this weekend’s game there’s that lingering issue that always seems to plague the Ivy League when they stage a clash of all-time football teams – that their champions, or runners-up, or any of their members, refuse to participate in the playoff structure of the subdivision of Division I football in which they compete. The Ivy League competes in Division I Football Championship Subdivision, which has “Championship” right there in its name. They compete in the same subdivision as James Madison, North Dakota State, Jacksonville State, and the rest of the teams that will be competing in the official FCS playoff bracket. The “Championship” that is baked into the name “FCS” is not a championship that Ivy League teams choose to participate in. There are other FCS conferences that choose to opt-out of the FCS championship playoff bracket, but those conferences don’t eschew any sort of postseason at all. The SWAC stages a championship, and the winner of that game and plays the winner of the MEAC in a postseason game called the Celebration Bowl. You could argue that both of these conferences have good and bad reasons for (essentially) opting out of the FCS Playoffs, but at least their champions have a postseason opportunity. For the Ivy League, there is no postseason, and pretty much the only reason why is because the Presidents of the Ivy League just say that it’s so. Oh, sure, there have been weak justifications for the Ivy League’s postseason ban over the decades. Like the one where football playoffs would detract from the studies of football players, even though lacrosse, fencing, and a multitude of other Ivy League sports manage postseason and finals just fine, without the “protection” of the Ivy League presidents denying them a postseason opportunity. Then came the call of “tradition” – stating effectively that, well, banning the postseason was always done by the Ivy League, and therefore should be a tradition that the Ivy League should keep. Except that postseason contests like the Ivy League men’s basketball tournament are now the norm in the Ivy League, with football pretty much the final, lone postseason ban to which the Ivy League Presidents cleave. If the Ivy League champions this season were a .500 team that had a hard time competing out of conference, the Ivy League opting out of the FCS playoffs wouldn’t be a big deal. But this season one can’t help but speculate how these Princeton and Dartmouth teams might do against some of the other teams in the East in the FCS Playoffs, against James Madison, North Dakota State or Jacksonville State. 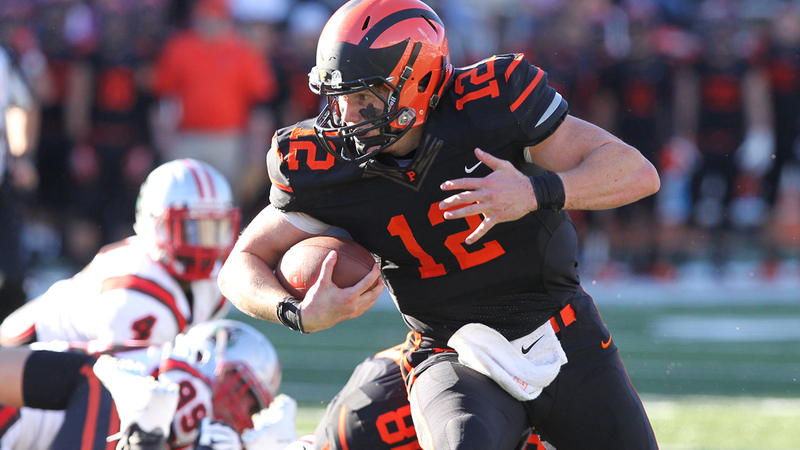 Princeton QB John Lovett presides over the most prolific offense in FCS, ranked atop the subdivision netting 543.9 yards per game, a full 10 yards per game above their closest competition. A tough SOB that is tough to bring down, he also has a tremendous touch on his passes, of which he’s completed 63% on the season so far. Lovett, who came in as a “slash” QB in 2015 and 2016, made his early name in head coach Bob Surace‘s wacky offensive formations in those years, sometimes lining up with 3 QBs in one formation. Now for Princeton, with Lovett as the unquestioned starter, they haven’t needed Lovett in the second half of almost all of their games. Only in a 29-21 win over Harvard was Lovett needed to kneel in the victory formation. What sometimes gets lost in Princeton’s offensive prowess is their defense, who have only yielded more than 20 points once all season. The Tiger defense has notched 45 tackles for loss in 7 games, with 23 different players registering at least a 1/2 tackle for loss. LB Samuel Wright leads the Tigers with 5. That’s a big difference from last year, when the Tigers gave up more than 30 points in their last three games and lost 54-44 in a shootout on the final weekend of the season. The real question on Saturday afternoon at Princeton Stadium might be which defense reigns supreme, Princeton’s or Dartmouth’s. That’s because while Princeton sits at No. 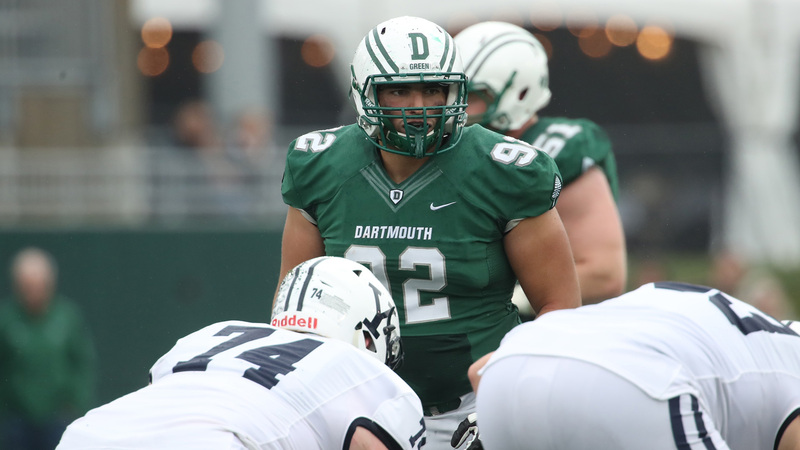 7 nationally in total defense (269 yards per game), Dartmouth sits right behind them at No. 8 (270 yards per game). Unlike Princeton, who has more of a no-name, distributed defense, Dartmouth has a standout star, DL Rocco Di Leo. His 7 sacks are good for 10th in all of FCS, and he heads a defensive front that is just as aggressive and just as effective as Princeton’s. 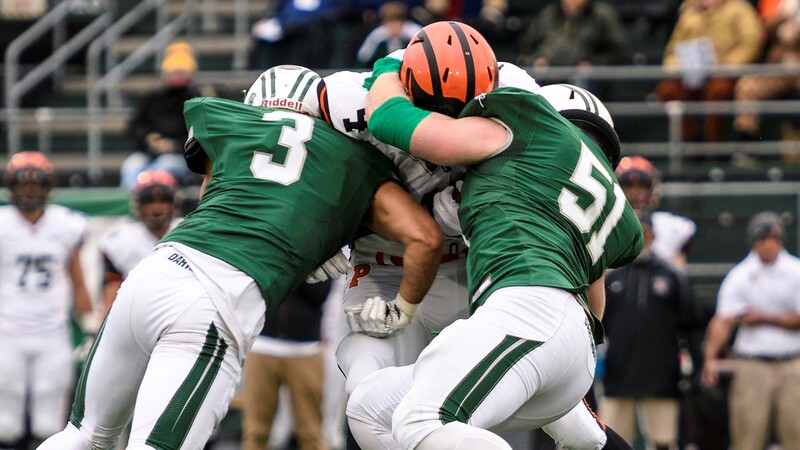 Princeton will want to know where Di Leo and LB Jack Traynor (6 1/2 tackles for loss) are at all times, as teams are only averaging 2.9 yards per carry against the Big Green this season. The Dartmouth defense has also been the master of the takeaway – they have 12 interceptions and 7 fumble recoveries, putting them at +15 in turnover differential, first in FCS. Dartmouth has been getting things done offensively mostly on the ground, though QB Derek Kyler only has one interception on the season and is a dual-threat QB that can kill teams with his arms and his legs. QB Jared Gerbino, a more rushing-focused QB, also gets a lot of playing time as well. Eleven skill players on the Big Green have positive rushing yards, and it’s in large part thanks to a tremendous offensive line. 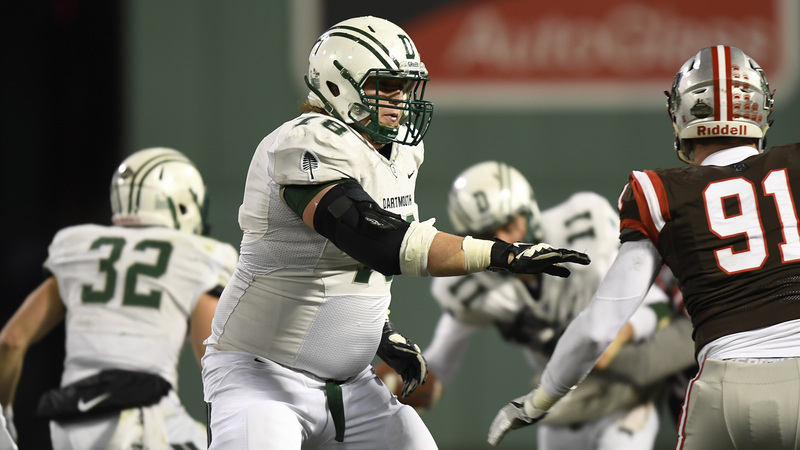 “I thought our offensive line was outstanding [vs. Harvard],” Dartmouth head football coach Buddy Teevens said this week. “[OL coach] Keith Clark and his group do a consistent job at a high level, and that allows the running backs to all exploit opportunities, and that was crucial on Saturday as the weather was not cooperative.” 6’7, 325 lb senior OL Matt Kaskey anchors the Dartmouth O Line, and is seen as an NFL player by Surace. Isn’t this why the FCS has a postseason – to showcase the subdivision’s best teams? To showcase some tremendous college football players, some of whom might be bound for the NFL? This weekend, football fans ought to be watching the two best teams in the Ivy League face off against each other in what should be a whale of a football game against two of the finest teams in the FCS. The only problem is we’ll never know if either team could have added “national champion” to their list of postseason accolades. For that, the blame lies squarely on the Presidents of the Ivy League schools. But it’s an excellent point that having caved on holding a season-ending basketball tournament, the time has now come to participate in the FCS playoffs. Ivy teams are rarely this good, but it would be exciting to see them compete with other programs in a year like this.